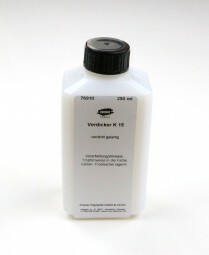 Thickener K 15 | Thickener für Dispersions | Dispersions & Binders | Mediums, Binders & Glues | Kremer Pigments Inc. The final strength is reached only after 12 hours. Add dropwise to acrylic medium. Store safe from frost. Thickener for dispersion paints, synthetic resin plasters, glues. Customer evaluation for "Thickener K 15"